Auto Body shops maintain and run a variety of equipment and processes that create hazardous air pollutants, dust particles, and other chemicals. Once these chemicals are airborne, they not only create dust or film over everything in the shop but are hazardous to the health and safety of your workers. Paint, primer, polishes, and fillers are some of the most dangerous culprits for auto body shops. The process of removing paint from surfaces, sanding down filler and smoothing out body panels all create airborne dust that may contain hazardous particles. These substances can damage the skin, irritate the eyes, and cause damage to lungs or respiratory tracts if they are not collected properly. 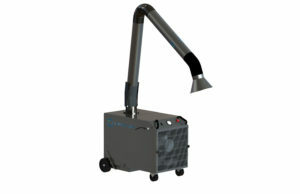 Risk increases with large amounts of concentrated dust that is allowed to accumulate over a long period of time. In some body shops, particularly shops that focus on the restoration of classic cars, lead is used in preparation processes, which creates an elevated health risk during prepping, sanding and finishing processes. Small amounts of lead can be filtered out with HEPA filtration while larger amounts should be addressed through direct ventilation units. Fine dust created from hardeners that are often combined with fillers for bodywork and glass fiber fillers is another invisible danger. It irritates the skin and causes irritation and other skin problems such as dermatitis. Dust particles also pose the risk of combustion and explosion, especially when combustible dust is allowed to accumulate over a period of time. As an example, aluminum dust is highly explosive and can lead to property damage or personal injury if not handled appropriately. According to IBIS World, Industry Market Research in 2018, over the last five years, the Car Body Shops in the US industry grew to 3.4%, reaching a revenue of $47 Billion. Congruently, the same number of businesses has grown by .4% and the numbers of employees by 1.7%. There are an estimated 352,196 workers in car body shops in 2018. That’s a lot of workers and a lot of health hazards if the appropriate precautions aren’t taken. If you are an owner of a body shop or work in an auto body shop—air filtration and ventilation and collection of dust are some of the biggest values in working and operating, a safe and healthy work environment. Ensuring harmful particles and toxins created from your work are filtered and that your facility is adequately ventilated to prevent the buildup is critical to short and long-term problems. Respiratory complaints, chest tightness, wheezing, coughing, phlegm buildup, and occasional sleeplessness are all commonly seen health problems from auto body shops that don’t maintain industrial air filtration units for dust particles and other toxins. Beyond problems with lungs and breathing, chemicals can also cause skin irritation and allergic reactions—especially in paints. There is a common chemical called isocyanates that is common in paints, paint material, and spray-on-liners, and it can have severe health effects if not handled correctly. OSHA regulates auto body work and particularly paint booths because of these common hazards. Regulations deal with hazardous materials, protective equipment, fire controls, electrical, machine guarding and environmental controls along with others. It’s important that you are familiar with these regulations, visit the full OSHA standards list here. 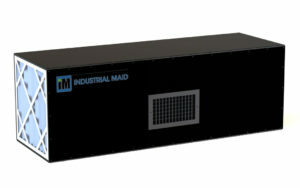 The importance of industrial air filtration and ventilation in auto body shops—and auto body shop filtration is a big reason why Industrial Maid focuses on this industry. 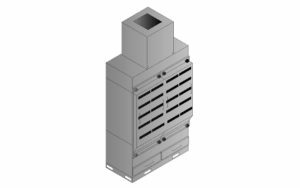 Our dust collection units contain HEPA filters that are specifically designed to safely remove toxin dust and filter with an efficiency of 99.9%–eliminating all risk for your employees and yourself. We work every day to ensure workers in welding shops, machine shops, auto body shops, and other industries work in safe and healthy breathing environments. 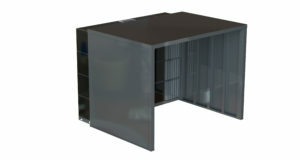 Some of our most popular industrial air filtration and ventilation systems are shown below. 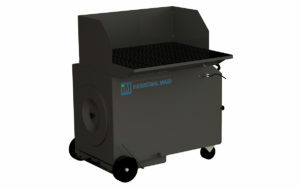 Click on each product for more detail or visit our website at industrial-maid.com to learn more. 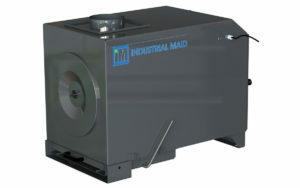 To get more information on Industrial Maid air filtration and ventilation products visit our website, or learn more about the collection from grinding, sanding and finishing activities. Learn how to choose an industrial air filtration system.